CHALLENGE: Make a piece of home decor, big or little, inspired by scrapbooking, made with scrapbooking supplies or both. That's right, you got me...not a big lover of the vintage (ducking the tomatoes now). What I do love is re-purposing and re-using. Yesterday I was moving two boxes of Eric's old family photos into a new space and came across an empty frame. You know, one of those really thin gold colored ones that every old photo seems to be housed in? What really struck me about it was the corrugated cardboard backer. I was immediately inspired by April's flower frames from CHA and my newest love, the ribbon roses from the Dear Lizzy line. 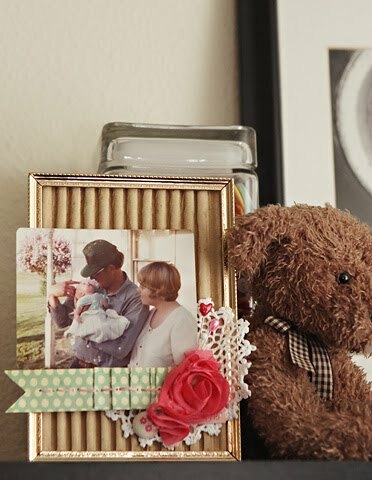 I've had a picture of my parents & myself as a newborn in a picture clip for a while...wanting to frame it, but not sure of the best option. It very much seemed like kismet to find the old frame yesterday. I gathered a few little bits & bobs that were lying around from past kits and made a copy of the photo--like the original, I rounded the corners and roughed it up a bit. My goals were: 1. not frame the photo in the traditional sense 2. use the awesome cardboard backing and 3. draw attention to the photo, not necessarily the old gold frame. Quick. Painless. Scrap inspired and scraps used. A side benefit being I was also able to re-purpose something I didn't actually love into something that I do. I can't wait to see what you do--post to my thread on the message board and I'm pretty sure Susan will draw a name for a $5 Studio Calico gift card on Saturday. 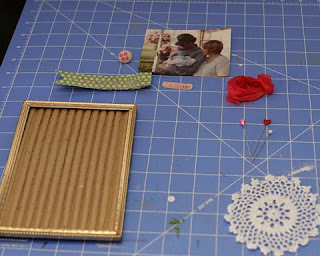 We'll be back the rest of the week with some member inspiration, a tutorial & lots of eye candy! FUN! Just got something done!